I started running cross country in Grade 4. Mr. Pye, the school gym teacher who coached cross country, got me involved. After a few times running cross country, my mom then put me into track and field. I then realized how much more I enjoyed the shorter and faster distances. You come from a multi-sport background, competing in both track and field and hockey. How do you find these two sports, and the skills used within them, work with one another? Track and field helps my hockey in that having to have fast feet and a quick stride in my sprinting helps with my skating and acceleration in hockey. The fitness I gain from hockey, along with the competitive nature it fosters, helps me in my track races. At last year’s NLAA Junior High School Championships, you were the only competitor from Holy Trinity High School, but achieved a perfect score by winning the 100m, 200m, and 400m, and were the only competitor to capture three golds that day. How did you stay fresh for all three events on the same day? In between races, I made sure I cooled down properly and refueled my body. I also warmed up carefully for each race and had adequate rest. At last year’s Atlantic Track and Field Championships, you had a spectacular showing, producing impressive times in both the 200m (26.80) and the 300m (43.21). Take us through your weekend competing in Charlottetown. In Charlottetown, it was extremely warm compared to what it is like during our summers in Newfoundland. That was a very difficult adjustment. I was very excited going away to compete at Atlantics, as it was shortly before Legions and gave me a chance to get myself ready. I felt very strong for each race I ran there, even in the heat, I think I ran some of the best races I have ran so far at the Atlantics. I didn’t know many people I was competing against, so it made me want to push myself even more. It was an all-round amazing weekend with an amazing group of people. You competed at the previous two editions of the Canadian Legion Track & Field Championships, and had rather large improvements in your performances between. What are your goals as you start preparing for this year’s edition of the Championships? Having moved up to the U18 category, so my first goal will be to make the provincial team and qualify for Legions. If I am able to do that and attend Legions, I would like to PB in the 200m and, as it will be my first year competing in the 400m, I would like to set a new PB and be just as competitive in that event. I think we will have strong relay teams, and I would like to be a part of any relay team as I think we have the potential to set provincial records. Having just moved up to the U18 age class at the start of the new year, the race distances offered has changed, in your case from the 300m to the 400m. What are your thoughts on contesting this longer sprint event? I had just started to really love racing the 300m and therefore I am very disappointed that I won't be able to compete in it this season, now that I have moved up to the U18 age class. However, I'm also excited to see what happens with the 400m. I have ran a few 400m races before, just to get a feel for them, but never really spent much time training for it. I am excited to see what will happen now that I will be training and competing in the event on a regular basis. In recent years, competitive sport has been a sensitive and controversial topic in Newfoundland & Labrador, particularly since the province delayed hosting the 2021 Canada Summer Games, moving them to 2025. As an upcoming athlete who is eligible to compete in both editions of these Games, what are some of the difficulties you face in facility-usage, and how does this impact your training? We make the best of the facilities we have. Our indoor track is located in St. John's and is open to the public. Whenever we are indoors training, there are also many others working out or walking around the track. It does get crowed sometimes and difficult when we are doing sprints. We often run into someone jogging in the outside lanes, making us have to slow down, or try and switch lanes while continuing the workout. It is so exciting when we finally go outdoors after the long indoor season. It is a bit of a longer drive, as the outdoor track is in Mount Pearl. I live in Torbay which is a little farther from most things, but I would much rather the longer drive and get to train outside, then the shorter drive and have to train indoors. Aside from facilities, the weather in the province has been said to cause a lengthy indoor season, and make training difficult during the outdoor season. From your experiences, how does the weather affect sport in the province? Here in Newfoundland, our weather isn't the best year round. We have a very long winter which causes us to have to move and train indoors early, and then we don't get to return back outdoors until later in the year compared to most other provinces. I am an athlete who loves training outdoors so I find it challenging that our indoor season is so long. Also, we get a lot of wind all year round, especially in Mount Pearl where our outdoor track is located. It’s at a high elevation, so it can make training more difficult when there is always a strong head wind coming towards you. Some people will see this as a disadvantage, but I see it as something that helps us and makes us strong. When we go away to compete, it feels like a weight has been lifted! Running without wind against you is a fantastic feeling, but when there is wind, we can push through it, because we are used to always training in it, where others may not be. Balancing school and sport is a necessary requirement for all athletes among your age group, and requires a certain degree of organization. At this time of year, what does a typical week of school and sport look like for you, and how do you balance each of these? A typical week during the school year can get busy. Throughout the course of a week I usually have track four days (Monday, Wednesday, Thursday, and Saturday) and hockey usually four or five times each week (Monday, Wednesday, and twice every Friday and Sunday). I travel at least one weekend each month with hockey. Once May comes, I also begin my rowing season and am on the water four or five times each week in preparation for the St. John’s Regatta. This year, I am switching over to slide seat rowing. Tuesdays are the days where I try and get a lot of school work done, I stay after school every Tuesday for extra help, and then go to tutoring that night, just to make sure I understand everything and to better my marks. Besides that I try and get most of my work done in class and get extra study in at night so that it doesn't cause problems with my activities during the day. It does get hard to balance everything at once. With the indoor season soon coming to an end, do you have any big plans or goals in mind for the upcoming outdoor season? With the outdoor season soon coming up, I am really excited to see what it brings. I have many things I would love to accomplish, such as making Team NL, competing at Legions, and setting new PB’s. I would love to medal again this summer at Atlantics, and maybe even give the 800m a try. What are your future plans for your second sport of hockey? I have been playing hockey since I was 4 years old, so I don't plan on ever giving it up. I currently play female AAA and boy’s high school hockey, so it is a lot to balance with track. As of now I plan on playing boys high school hockey until I graduate. I also plan on continuing to try out and compete with Team NL until I reach the age limit. Next season though, I can see myself dropping the female league, because I want to really turn all my focus to track and field. I don't know what will happen after high school, but I'm sure I will continue competing for a long time. Aside from sports, what are some of your other hobbies? I love hanging out with my friends and I love listening to music, I always have headphones in everywhere I go. The first thing I do in the morning when I get up to get ready for school is put on my music. My family usually complains about how loud I play it so early in the morning! 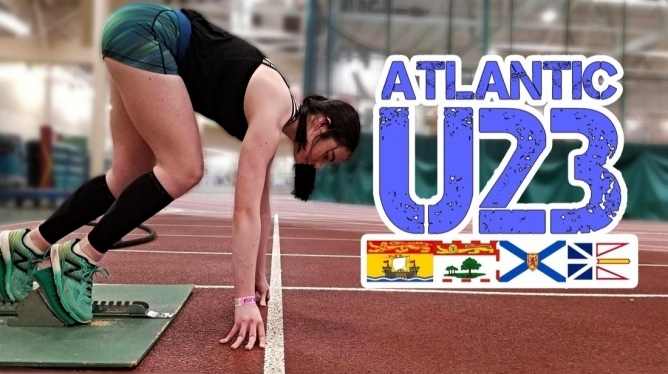 >Hosted by New Brunswick-born track runner, administrator, and coach Brandon Scott LeBlanc, AtlanticU23 is an interview series with upcoming Atlantic Canada track and field athletes under the age of 23.